FUSD has posted a revised 2018 school year schedule. Unless otherwise notified, FUSD will have the following schedule changes beginning Wednesday, May 9th, through the remainder of the 2018 school year. 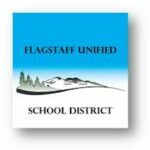 FUSD’s Special Education Parent Advisory Council (SEPAC) will bee from 5:30 to 7 p.m. Monday, Jan. 8 at the FUSD Administrative Center, 3285 E. Sparrow Ave., Flagstaff. 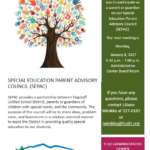 SEPAC provides a partnership between Flagstaff Unified School District, parents or guardians of children with special needs.